One of the pleasant aspects of the ukulele is the nice symmetry between the four strings and your four fingers. But there are very few times in life an extra finger wouldn’t come in handy and for the non-polydactyl amongst us a capo does a pretty good job. And they’re so easy only a moron could get it wrong. Capos are most useful for changing the key of a song. For example, if the song is in F but you want to play it in G you can put a capo on the second fret and play the chords exactly the same. It can also make a song easier to play. If you’re trying to play a song in Bb you can put a capo on the first fret so now the A shape gives you a Bb. If you don’t have a capo I’d recommend picking one up. They often come in handy. And it’s not often you get the opportunity to buy a new finger (although there was that time I bought a human toe – long story). This is the type of capo I’d recommend getting for ukuleles. Its big advantage is the variety of sizes of uke it fits. It works on all the ukuleles I own from my baritone to my tiny Kala Pocket Uke sopranino. – The fastest to put on. – Secure and no buzzing. – Fits all sizes of ukulele. – Tend to be the heaviest of the capos so can off-balance your ukulele. – If you’re as clumsy as I am you might find it flying out of your hand with a frankly terrifying amount of force. Here’s some footage of the last time it slipped out of my hand. – Can be a little too firm. If you’re not careful, it can bend the strings out of tune. Tip: You can mostly avoid the bending problem if you rest the capo against the back of the neck before clamping it down on the strings. 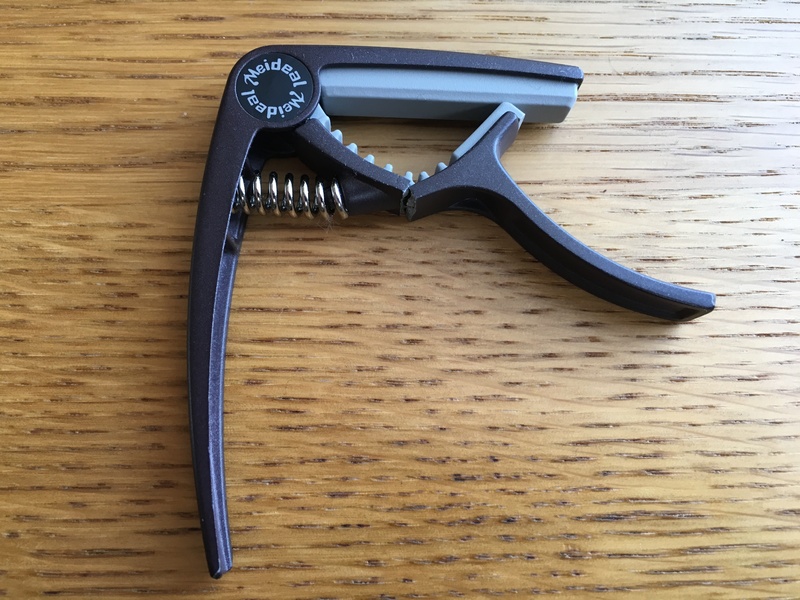 UPDATE: Since writing this post my clamp capo broke. I still recommend this style but go with a less junky brand than I did. Most of the trigger capos I’ve seen look like the were made in the same Chinese factory and had a logo put on them. So I wouldn’t worry too much about the brand. This is my favourite type of capo. But I don’t recommend them above trigger capos as they are limited in which ukuleles they fit. Mine works great on my Ohana tenor (which has a thick neck), not so great on smaller ukuleles. If you do get one of these make sure it’ll fit all the ukes you want to use it on. – Firmly holds the strings down. – Very easy to fine tune to suit your uke. – Won’t fit all ukuleles. 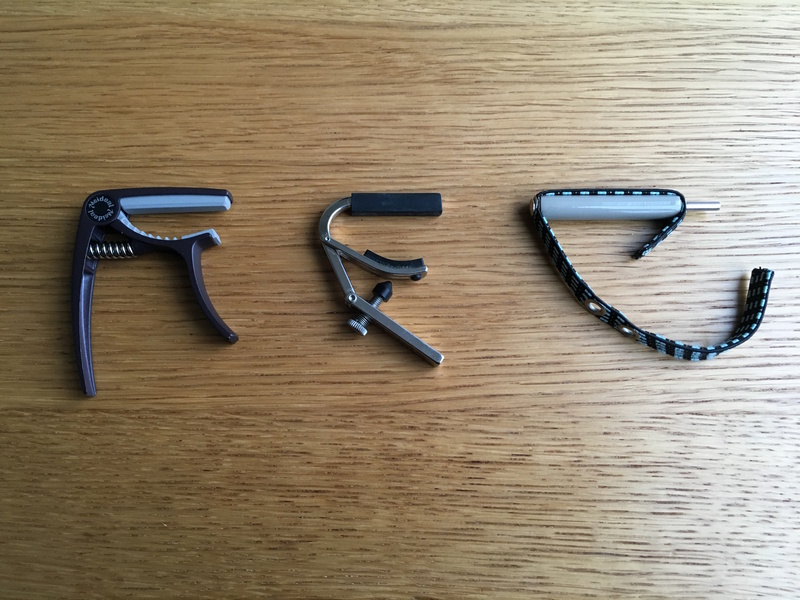 The big name in these capos is Shubb. Mine’s a Shubb screw capo and I can recommend it on the proviso that you’re sure it’ll fit your uke. This is one step up from a pen-and-elastic-band capo. The concept is the same: it’s a piece of plastic held on by an elasticated strap. The capo in the gif is actually for guitar rather than ukulele. I never bothered getting a ukulele one because they’re pretty crappy. – Fits most sizes of ukulele. – Complete pain in the arse to put on and take off. – Least secure. I find I knock it out of place when playing now and then and it does create more buzzes than the other styles. – The elastic does mean it can fit a bunch of ukuleles but not all of them well.